Hillstream loaches are small freshwater species found in the fast flowing streams of Asian tropical rain forests. In the wild they glide over smooth rocks in strong currents and can easily climb vertical or even overhanging surfaces. Understanding how these tiny fish cope with such extreme environments might lead to significant breakthroughs in fluid dynamics, perhaps allowing us to reduce the drag on ships, or reduce the cost of pumping water around domestic central heating systems. 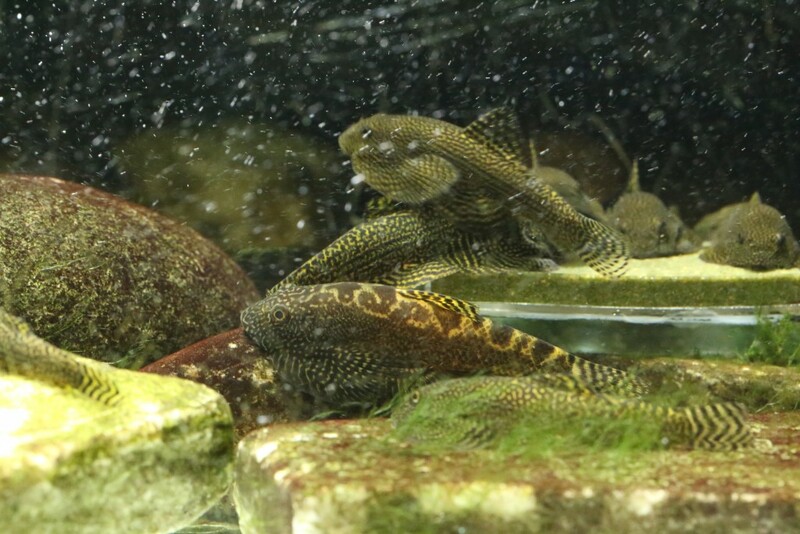 Hillstream loaches have unique scale structure and body shapes, and it may be these adaptations that allow them to fight the current without expending significant amounts of energy. Our experiments are only worth doing if the fish we keep in the lab are healthy and behave like they do in the wild. We have spent several years improving our aquariums to match the ecotypes the hillstream loaches prefer. To that end we went to Borneo to see them in the wild. We used our observations combined with scientific literature to design tanks and husbandry systems that consider both their physical and cognitive needs. Hillstream loaches come from mountain streams in rain forests. It rains a lot. Surprisingly there is often only a thin layer of soil over bedrock or clay. So, rain reaches the streams quickly. 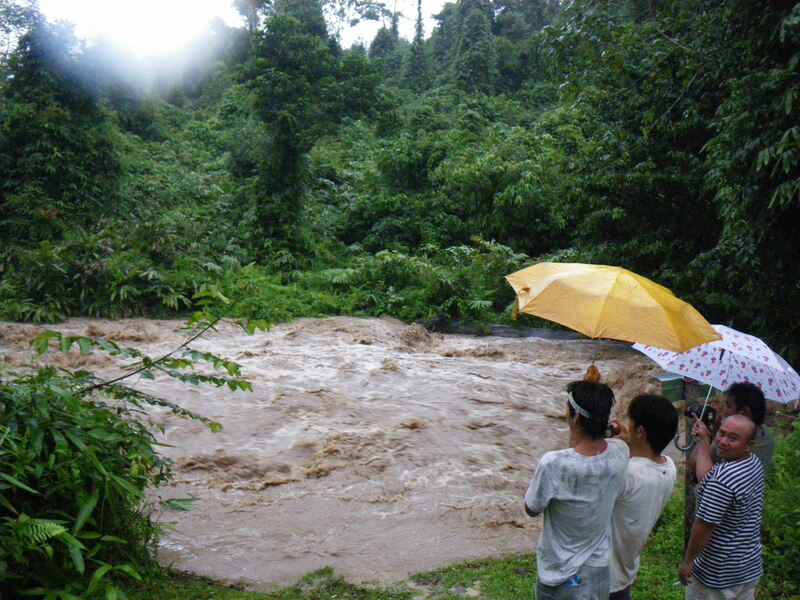 A river, normally a trickle, turns into a torrent in a few hours, or even minutes. Leaves, twigs, silt, gelatinous algae, and anything else that can’t get out of the way, or hold on, is swept down on a torrent the colour of milky coffee. A couple of hours later, the clouds clear, the sun reappears; four or five hours later the sediment drops out and the water clears. This cycle is repeated every couple of days to every few weeks depending on the season. The seasonal variation is far less than in temperate climates. People in Borneo eat these fish. But it is usually quite a trek to high mountain streams, and so they aren’t eaten often. But everybody knows about them; locally they are called rokot. 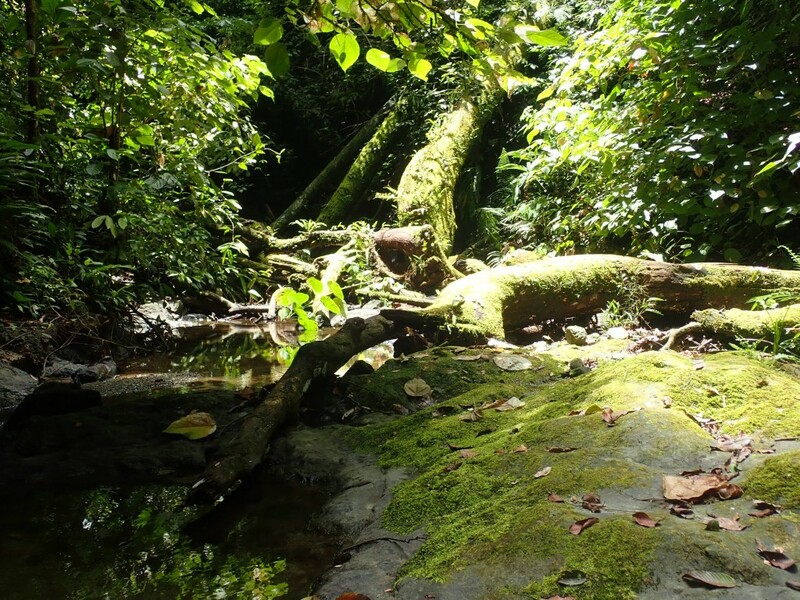 Many of the people we met had fond memories of catching them as children on adventurous hikes into the jungle and were keen to advise on capture. One indicator was a certain aquatic snail. “Where there are snails there are rokot.” It was true and useful as the fish could be difficult to spot. We were looking at methods for sampling the fish in the future without harming them, so we captured a few with hand nets and photographed them before returning them all to the rivers. To keep hillstream loaches happy, the tank does not have to be overly complicated but it should have some specific features: fast flowing water to allow algae to grow in strong lighting, darker protected areas with slower flow and even some areas with little or no flow. Variation is the key. Like a tiny Michael Phelps, hillstream loaches probably need a regular workout in vigorous conditions to stay in top form. This is likely to be not only important to maintaining muscles and overall fitness, but also plays a role in keeping them mentally active and stimulated. Perhaps these fish, the ultimate flow specialists, get bored, worried or stressed in flat calm water. Achieving flow rates in an aquarium that are comparable to those found in the wild can be difficult. Ideally, water should be moving about 1-2 meters per second. The average high power aquarium pump (e.g. Eheim 5000) can move water at a rate of about half a meter per second and this speed quickly drops off only a few inches from the pump outlet. If you were aiming for a current of 2 meters per second throughout a 120L tank (100 x 30 x 40 cm) you would have to shift the entire 120 L twice a second – that’s some aquarium pump (900,000 Litres per hour)! To achieve this in the lab, we had to set up a custom built flume that uses a full size electric outboard boat engine to drive it. There is an easier way to get fast flowing water in an aquarium: keep some areas of the tank shallow. What we saw when we looked at the hillstream loaches in Borneo has been directly applied to our tank design and husbandry. Water is pumped to the upper shallow platform then flows over rocks, and falls back into the main tank, down a ramp or over a waterfall. We use 2 Eheim 5000 pumps at full speed in a 100L tank through sponges on strainers to move the water from the main tank to the upper platform. A rich layer of algae grows on the rocks in the upper section in strong light. The waterfall oxygenates the water and also provides constant sound; the ramp provides access and an interesting variable flow feature (they cling to the bottom and the top of it). We use offline filters, and encourage shrimps, snails, and algae to share the tank. We do not have substrate in the main tank, just large rocks and bogwood. Thus the tank has both falling water and areas with moderate to low flow. In the wild, when the stream floods, loaches climb rather than shelter. This time may be the equivalent of the Olympic final for the miniature Michael Phelps. The deeper water may allow them to get over objects that would be barriers when the water is shallower, and may also be when they can more easily evade predators. 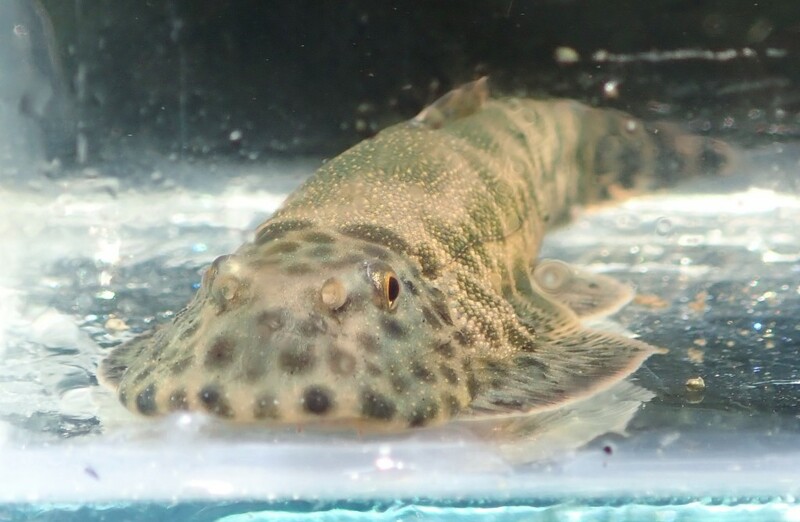 Walking catfish (Clarias batrachus) are potential predators – catfish use suction to catch prey and so the loaches’ ability to remain attached passively without substantial muscular effort may be a benefit in a surprise attack (hillstream loaches often continue to stick by suction even when dead). This behaviour in stream flooding is subtly important, because it means they are not challenging their physical limits all the time, and again like Michael Phelps; relaxation, rest and social activities are all parts of ensuring peak performance when necessary. Often we found them in calm clear pools, without excessive flow (0.2-0.4 m/s). Here they would graze and share space with shrimps, other fish and snails; naturally inquisitive but always near shadows, near fast flowing and falling water; always vigilant. Our tanks are designed to mimic these variable conditions in shelter, lighting and flow. We also use offline living filters. These tanks are connected to the main tank via smaller pumps (a single Eheim 3000 for instance pumped through strainers and sponges). The return water is piped onto the upper platform of the main tanks, often through a spray bar, to add to the shallow fast and sheet flow. These tanks contain filter sponges, plants (Anubiasspecies), shrimp, snails and round fish such as Danios. We may also put peat, Catalpa leaves, Alder cones and bogwood in here. We feed the Danios flake and some circulates through the main tank. These tanks provide a range of filtering and nitrogen cycling services which help ‘feed’ the main tank. The idea is that they act like an upstream section of natural river adding smells and nutrition in the same way. “The Borneo Suckers” by Dr Tan Heok Hui provides a good idea of what hillstream loaches from Borneo are used to. The average pH of the water from field notes in the book is 7.5 (Only 14 records ranging from 6 – 8.7). There’s no similar book for the butterfly loaches of Vietnam (Sewellia) but there is a great scientific paper for the Sinogastromyzon puliensis, a similar species found only in Taiwan. Shyi-Liang Yu and Teh-Wang Lee sampled fish in over 60 river sites in the wild. Average pH was 8.2 (range 6.2-10.9), average temperature 23 oC (range 18-30), average flow 0.9 m/s (range 0.12-2.32). These average parameters for pH and temperature are therefore a good place to start – we always aim for them; also we keep the kH over 7 which pulls the pH up to roughly 8. We do not measure pH or GH as a rule, but rather only monitor and maintain kH around 8 to 10 units. We tested the water in Borneo with standard aquarium test kits (API liquid test kit kH, GH, and pH) and confirmed these average figures were accurate for 5 locations where we found fish. While hillstream loaches will eat standard fish food (e.g. TetraMin flake and TetraMin ‘Baby’), we have found that they need to eat algae to maintain long term health. We use Repashy Soilent Green gel as a supplement to ensure they always have access to a well-balanced diet. Then there are many types of algae. Some algae only grow in fast flow. After rocks have been grazed by adult hillstream loaches for a few months they develop a dark red-black algal layer that is full of bacteria, crustaceans, diatoms, and other food such as snail and shrimp eggs. Gelatinous algae can be a sign that there is too little flow in the tank. Gelatinous algae is not toxic to the fish – it just stops them getting at the stuff they like. Because these fish are used to change in their natural rivers, they do not mind a big water disruption. Weekly we clean the tanks by removing all the rocks and wood – everything out but the fish! So all the rocks in the main tank are replaced, rinsed in tank water and repositioned with a 40-50% water change. The changing pattern of rocks and caves, in a familiar pattern of flow, is a further stimulant to the fish, similar to the natural habitat, and allows them to explore and re-establish favourite places and routes. We often find small fry in the changed water and we move these to a separate tank for juveniles. We occasionally roughly scrape the rocks with an old knife, and the fish then seem especially keen to graze them after. The behaviour we observe in our aquariums is similar to what we saw in the wild. Like many loaches, hillstream loaches like to hide, especially from people, and we ensure they have adequate places to do so. These fish are also naturally inquisitive and social; while they may hide when we first enter the room, they re-emerge after only a few minutes. All sizes playfully spar with similar sized fish and they appear relaxed as they regularly explore the whole tank. One good test of health is breeding and we are pleased to say some of our fish more or less breed continually.